An award-winning baseball documentary produced by filmmaker Andrew M. Volpe, which documents the 1996-97 quest of his father, Michael, a life-long baseball fan, to find a new favorite major league team to support, will screen at the Ritz Theater on the evening of Nov. 13 as part of the Veritas Film Festival. 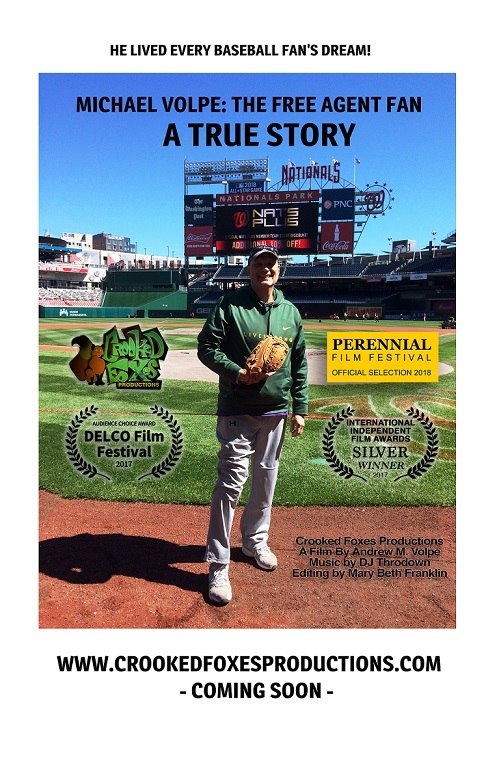 Volpe’s home video won both the Best Documentary and the Audience Choice Awards at the prestigious Perennial Film Festival, held March 24 in Punta Gorda, Fla. In July of 2017, Volpe’s film won the Audience Choice Award at Pennsylvania’s DELCO Film Festival. In June of 2017, Volpe won a Silver Award in the Best Short Documentary category from the International Independent Film Awards, judged in California. The film was also a semi-finalist selection in the March of 2018 Hollywood, Calif., Film Screenings Festival. The film documents how when the senior Volpe’s favorite baseball team suddenly traded his favorite player, he declared himself a “Free Agent Fan” and went shopping for a new team. He visited and trained on a number of major and minor league ballparks and met with officials from the Baltimore Orioles, New York Mets, Philadelphia Phillies, Miami Marlins, Durham Bulls and others. His saga was featured in Sports Illustrated, the Washington Post, the New York Times and USA TODAY and on major broadcasting outlets ranging from NPR, the Today Show and Good Morning America, to the CBS Morning News, CNN, Fox News and the BBC. The elder Volpe eventually selected the Philadelphia Phillies and Durham Bulls as his new favorite major and minor league teams. Andrew M. Volpe’s movie contains a narration of how the Free Agent Fan phenomena occurred, interspersed with videos of major media interviews, print articles and his original animation. He works as a producer and editor for a Virginia-based video company. He has also formed his own video production company found at: www.crookedfoxesproductions.com. Michael Volpe retired from U.S. Federal government service in 2014. 2016: The best sports year ever?